Seven populations were sampled, from the Bakkrans Nature Reserve, Camdeboo National Park, De Hoop Nature Reserve, Gamkaberg Nature Reserve, Mount Camdeboo Private Game Reserve and Swartberg Private Game Reserve and Welgevonden Game Farm. The researchers found that zebras are facing multiple challenges, including poor habitat and gender imbalances, which are likely to compromise their health, have repercussions for their reproduction and, ultimately, their long term survival. “Faecal hormone measurements are easy to collect without disturbing the animals and provide a window into the chronic stress animals are experiencing,” explains Dr Susanne Shultz, the senior author from the School of Earth and Environmental Sciences at the university. The team have used a “macrophysiological approach” for the first time to evaluate the effectiveness of an ongoing conservation plan. A macrophysiological approach involves comparing animal responses in different nature reserves or geographical regions. By evaluating patterns of stress on a large scale, at-risk populations can be identified as their profile will differ from healthy populations. The researchers also found that using physiological biomarkers, such as hormones from droppings, is an effective way of evaluating the impact of ecological and demographic factors on animal populations. This approach could also tell conservationists how other animals and species might respond to future environmental changes and stressors. Dr Sue Walker, who is head of applied science at Chester Zoo, said: “Zoos specialise in population management and have developed a wide range of innovative techniques to monitor the species under their care. As well as using this new approach, the particular species of the zebra was also important. Dr Jessica Lea, also from the School of Earth and Environmental Sciences and the paper’s lead author, said the Cape mountain zebra was an ideal model species to assess because it had undergone huge ecological and demographic changes in the recent years. Knowledge gained from the research has provided crucial insights into the Cape mountain zebra ecology. These findings can be translated into practical applied conservation management initiatives to support the species. 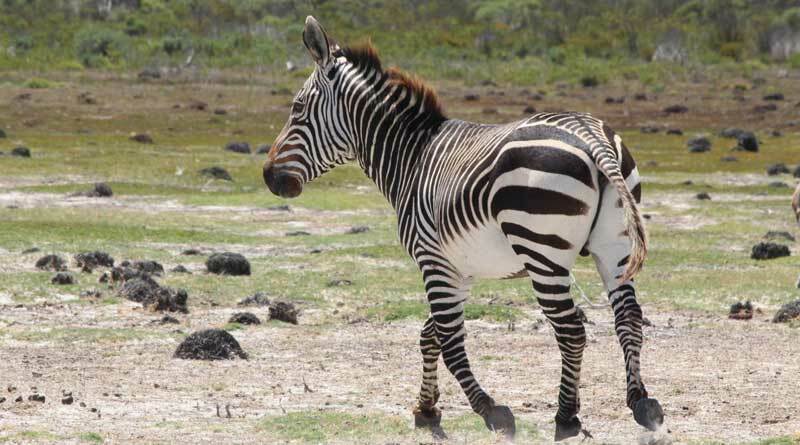 Cape mountain zebra are found in the Eastern and Western Cape provinces of South Africa. The majority of their historic and current range is in the Cape Floristic Region, but also extends northeast into Nama-Karoo, thicket and grassland habitats and northwest into the Succulent Karoo biome. The Cape Floristic Region has a Mediterranean climate and is known for its unusually high biodiversity and proportion of endemic species, particularly flora.